Easy to make channel stitched totes in 3 sizes. Use fabric with lines in the print for easier channel stitching. 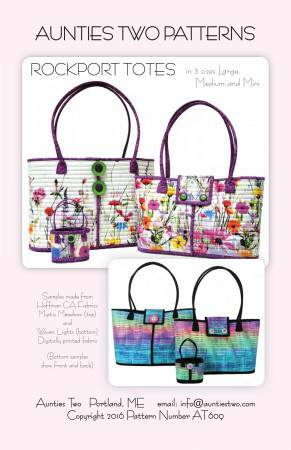 Large and Medium totes are great everyday bags with an optional closure. Mini totes make wonderful gift card bags or ornaments. This is a whole cloth version of the Camden Bag by Aunties Two.